NEW YORK, N.Y., May 18, 2011 (SEND2PRESS NEWSWIRE) — EASEUS Software, a leading provider of storage management, data backup and system disaster recovery solutions for Microsoft Windows, is giving away backup software – EASEUS Todo Backup Professional (worth $29), featuring powerful system backup and disaster recovery to get the computer up in minutes. Free: get the world-class system backup software now from http://www.todo-backup.com/products/promotion/free-get-tb-pro.htm . Apart from basic backup functions in other backup freeware, EASEUS Todo Backup Professional provides features to back up the entire system state including the operating system and applications on-the-fly without interrupting your work – get the system up quickly in just a few simple steps in case of system crash; no need to reinstall Windows and applications – and perform incremental disk backup which only backs up the changed files since last system backup, saving your time and disk space. – Clone or transfer data on a hard disk to another. Everyone will have the chance to get free EASEUS Todo Backup Professional if they share this giveaway on Facebook, Twitter, or blog; write unbiased reviews for EASEUS software, upload a how-to or personal experience video to YouTube; share ideas about Todo Backup software, etc. Media professionals and select companies can also join this campaign and get a certain amount of Todo Backup Professional licenses as a gift for their visitors or customers. For more details, please visit: www.todo-backup.com/products/promotion/free-get-tb-pro.htm . “Thanks to users’ long term support, we are able to provide this giveaway of our commercial backup software, sincerely hoping they can keep their data and computer safe and realize the importance of regular backup of their personal data,” said Mr. Liu, CEO of EASEUS Software. 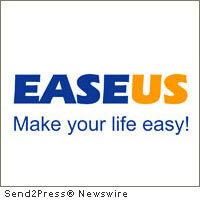 EASEUS Todo Backup Home, free for home users is available at: http://www.todo-backup.com/products/home/free-backup-software.htm . The company specializes in backup software, partition manager and data recovery for Microsoft® Windows®. Its major products are EASEUS Todo Backup, EASEUS Partition Master and Data Recovery Wizard. For more information, please visit http://www.easeus.com . Original Keywords: system backup and disaster recovery, CHENGDU YIWO Tech Development Co Ltd, EASEUS Todo Backup Professional, incremental disk backup, Windows 7 freeware EASEUS Software New York New York NEW YORK, N.Y.
REFERENCES: China Business News, system backup and disaster recovery, CHENGDU YIWO Tech Development Co Ltd, EASEUS Todo Backup Professional, incremental disk backup, Windows 7 freeware EASEUS Software New York New York NEW YORK, N.Y.